Well there's certainly been a lot of blogging lately about all the new features. I dunno about you, but I prefer the old fashioned episode review, and this week's left me (shocker) confused and/or confuddled. It felt like a bit of a slow episode to me, not so much with the narrative progression (though I admit not every ep has to be). I guess I just miss the Others arc, any what I call sidekick cast ep (i.e. Hurley, Charlie, Jin etc) I always like, but find a bit frustrating cause I wanna know more on DHARMA and stuff. Anyway, a Desmond flashback, and I was expecting to once more shout with anger at how they portray the British Isles with their roast chestnut stands, but actually this one was pretty OK. I didn't understand some of the stuff Desmond was saying, so thought "wow pretty Scottish then after all", and apart from the monk offering Desmond "a ride" (which I think is a little bit American-y and should have been "lift", but I guess it could be said and I'm being really nitpicky), I was quite impressed with the way it was done. By the way, in case you're wondering why I noticed that one word thing, its because I just wrote down literally what every character said in that episode for the Lostpedia transcript! That's right - I transcribe it for the wiki, review it for the blog, and will later post about it on the forum and chat about it on Lostpedia IRC chat. I need new hobbies. And wasn't that a plug and a half. So to the ep, and the fundamental question - the Flash or Superman?! Reminded me of an Angel episode when they argued who'd win in a fight between cavemen and astronauts. My money is definitely on Superman personally, though I don't really know anything about the Flash. 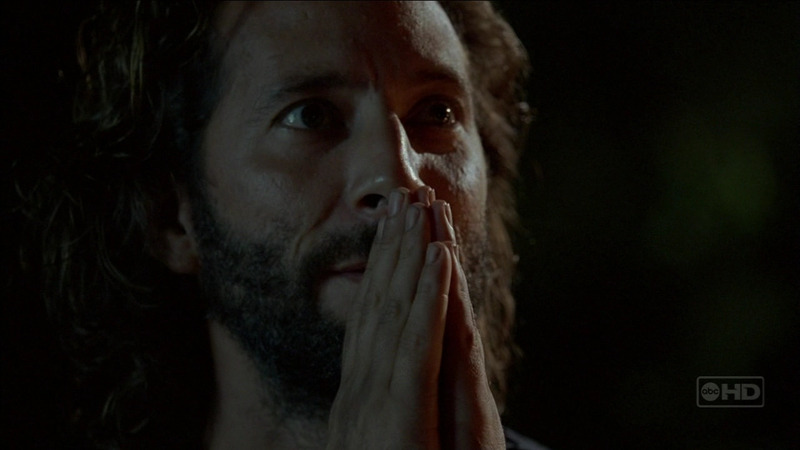 In flashback, liked how Desmond took a vow of silence, much like Mr. Eko. I feel they could have related. And it was interesting to learn how Desmond left his future wife. Was it actually a spiritual revelation? Or deep down is Desmond just a coward clutching at psychological straws about divine intervention? Its interesting to divide the realist skepticals and the believers, much like real-life I guess. Wow, deep. I also have had fun reading the theories about Moriah Vineyards. Aside from the huge Biblical reference (which many Lostpedians have gone into immense detail over - I didn't know so many of you guys read the good book?!) - I like the anagram possibilities - specifically "harmed visionary" - very inkeeping. I see DHARMA there too, so maybe there's something else in there of interest? I also looked closely during the scene at Ruth's house, there was a painting there of interest, kinda looked a little like Persephone I thought - anyone with high def please send me a pic of that, as it seemed quite interesting - and you know how we at Lostpedia love background artwork with our tea in the mornings. How great was that picture of the monk man with Ms. Hawking though? That blows it all right open - did she tell the monk to fire Desmond so he'd end up meeting Penny? Its that whole fate vs. free will thing I guess, but it implied she wasn't just Desmond's imagination when he had that flash after the Swan exploded - she was a real person connected to him. On the beach, nice to see Kate and Sawyer actually addressing the fact that they slept together rather than avoid the subject forever (please shippers stop uploading the screencaps, we get it, Skaters won OK!). Liked Sawyer's mix tape, a mention of Bernard! Hoorah, so he hasn't diasappeared since Live Together, Die Alone after all! I thought the Monster might have picked him off, he being the last of the Tailie-lords. And, by the way, was Kate actually crying when Sawyer asked? Didn't look like it to me. Finally, the man of the match award, going to Jin, with his happy march to go camping, and his hilarious ghost story. I desperately need the translation lol, please light up the comments section if you can find it anywhere. Where are all you Korean fans or Korean speaker fans! P.S. Was the fact that arrow hit Charlie's Adam's apple at all a reference to Robin Hood times where they hit apples on someone's head? Again, not much of an easter egg.